New Mexico's largest city is home to the annual Gathering of Nations Powwow, the largest celebration of Native American culture on the continent. The event draws participants from nearly 800 tribes in the U.S. and Canada for two days of dancing, contests, music, food and crafts. The powwow opens April 25 with the Miss Indian World cultural pageant, and continues through April 27 at the powwow grounds in Albuquerque. While you're there, you can take advantage of the other attractions in and around the Duke City, from New Mexico's unique fusion of Native, Hispanic and Anglo cuisine to the inspiring vistas on a hike in the high desert. Thankfully, there are plenty of relatively inexpensive flights between Chicago and Albuquerque. We pulled from travel site Skyscanner to provide you with a short list of flights and hotels handpicked for the occasion. Currently, the cheapest flights between Chicago and Albuquerque are if you leave on April 25 and return from New Mexico on April 29. Spirit Airlines currently has roundtrip, nonstop tickets for $314. If you fly out of Chicago on April 25 and return from Albuquerque on April 27, Delta can get you there and back for $360 roundtrip. Regarding where to stay, here are two of Albuquerque's top-rated hotels, according to Skyscanner, that we selected based on price, proximity to things to do and customer satisfaction. If you're looking for an inexpensive place to stay, consider The Hotel Albuquerque at Old Town. The hotel has a 4.8-star rating on Skyscanner, and rooms are currently available for $99. This spa hotel is located in the historical district, near the Albuquerque Museum, Old Town Plaza and the New Mexico Museum of Natural History and Science. If you're looking to treat yourself, there's The Hotel Parq Central, which has rooms for $120/night. 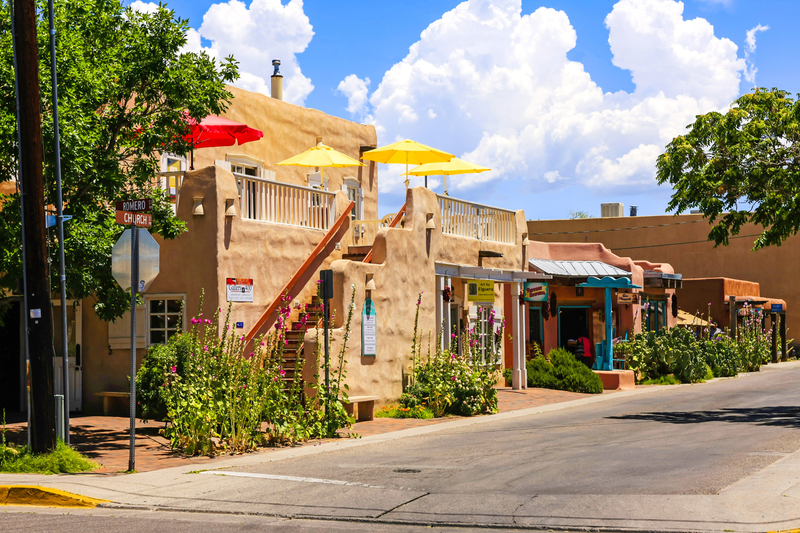 Don't miss Albuquerque's food scene, with plenty of popular spots to get your fill of local cuisine. Here are a few of the top-rated eateries from Skyscanner's listings. One of city's most popular eateries is The Frontier Restaurant, which has served the Albuquerque area and the University of New Mexico community since 1971. It has an average of 4.7 stars out of 28 reviews on Skyscanner. "Delicious and cheap food. Great for anytime of day since it is open almost 24 hours a day," wrote visitor Shelli. "Must try the orange juice and their famous sweet rolls." Another highly rated dining destination is Antiquity Restaurant, with five stars from seven reviews. The charming restaurant is located close to the Old Town Plaza and features fresh seafood, lobster, steaks, veal, chicken and pork. "This is your quiet date night restaurant in Old Town," wrote reviewer Susan. "It is located on a small side street off the square and reservations are recommended." Finally, there's The Grove Cafe & Market. To round out your trip, Albuquerque offers plenty of popular attractions worth visiting. Here are some top recommendations, based on Skyscanner's descriptions and reviews. The tramway contains the world's third longest single cable car span. It first entered service in 1966 and makes over 10,000 trips every year. "No visit to Albuquerque is complete without a trip on the tram!" wrote Alyce. "Travel a distance of 2.7 miles over 15 minutes' time via the tram to an altitude of 10,378 feet. Soak up the 11,000-square-mile panoramic view." Then, there's the Albuquerque Museum. Located in Old Town, it is dedicated to preserving and educating the public about the region's art and history. Finally, spend some time at The Albuquerque Biological Park, an environmental museum housing a large aquarium, a botanical garden, a zoo and a beach. There is a small railroad that connects these facilities.